Maxar Technologies’ SSL subsidiary plans to leverage its work with NASA and the Defense Advanced Research Projects Agency to build up its in-orbit satellite servicing business, SpaceNews reported Monday. 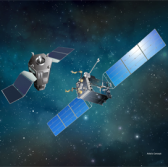 SSL works with DARPA to build a vehicle designed to repair, inspect, refuel and install payloads into satellites operating in geostationary orbit through the Robotic Servicing of Geosynchronous Satellites program that is set to launch in 2021. The company also collaborates with NASA’s space technologies mission directorate on the Dragonfly project that seeks to demonstrate how a satellite could self-assemble through the use of a robotic arm while in orbit. “DARPA and NASA have done [servicing] demonstrations in the past but to get traction for a sustained business is a big deal,” said Al Tadros, vice president for space infrastructure and civil space at SSL. “They want that so they can buy services rather than owning and operating a servicing satellite,” Tadros added.